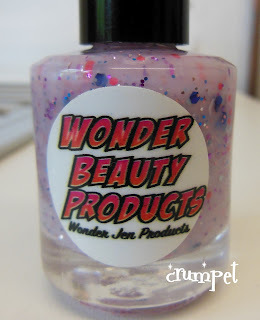 Today I have for you 3 polishes that were sent to me for review by Jen at Wonder Beauty Products. One of the best things about being able to review other people's products is how it introduces you to things you wouldn't normally try or buy. 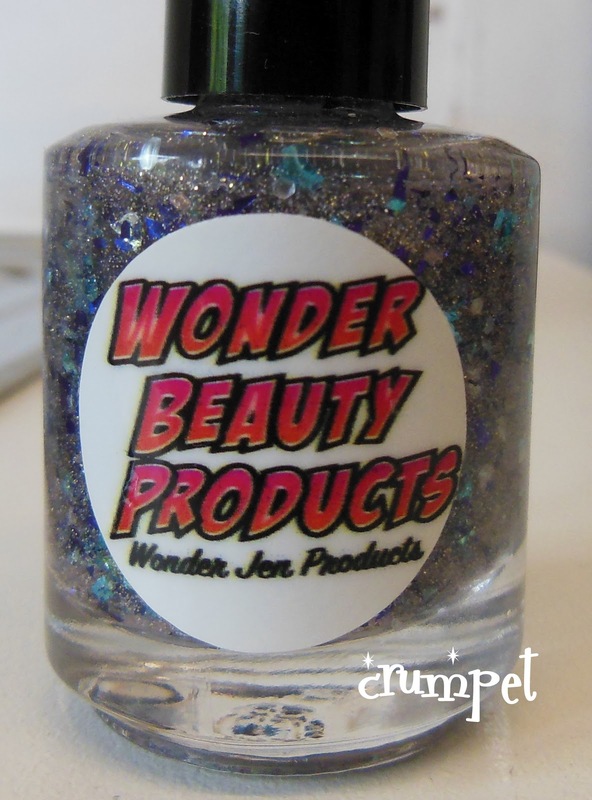 Jen's shop - HERE - is a great example. 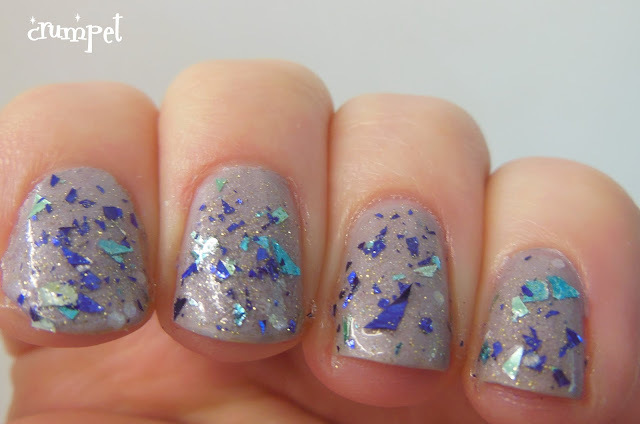 When I first saw her on Etsy, I was really attracted to her polishes, but she sold them as a "kit" - so you got the glitter, a clear polish and a brush, and had to make it up yourself to apply to the nail. Yeh, being messy, that just wasn't going to happen. Anyway, fast forward a few months and Jen now sells her polishes ready made too (you can still by the kits though, and she also sells polish ingredients) - hurrah! Less mess, less room for error, so let's get on with the show. 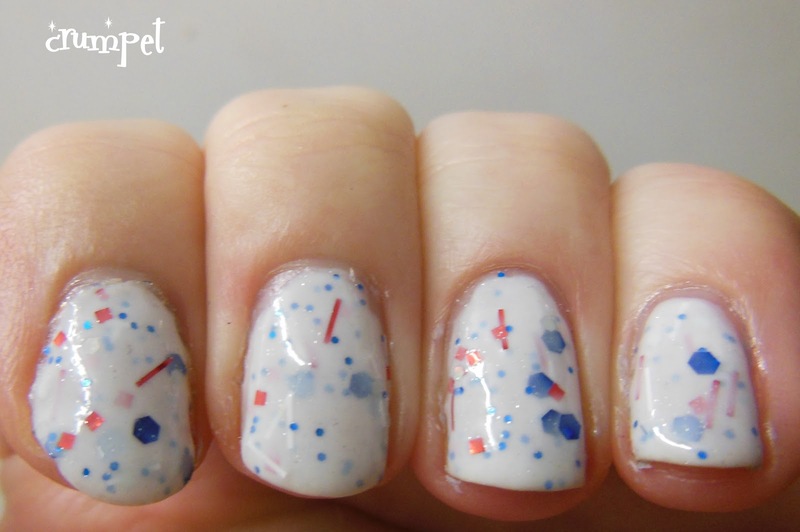 Firstly, I got sent ANOTHER white polish lol. Seriously, this is some crazy blogger joke. 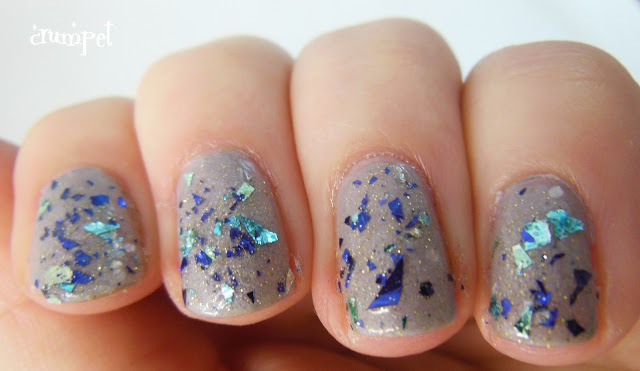 I get, I truly do, how popular these polishes are right now, but wow, it's like they're breeding! 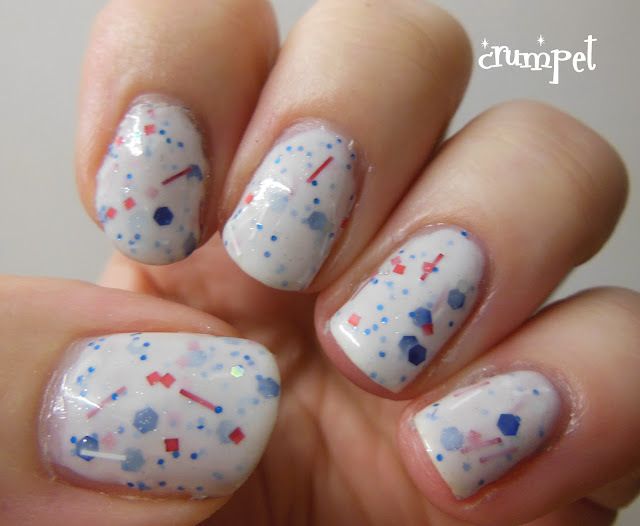 This is Let Freedom Ring, and it's just one of the white glitterbombs you can find in Jen's shop. To be fair, it's a very pretty glitter bomb. The thing I like most is the randomness of the glitter shapes and that there's only 2 colours. Let's face it, if it's got red squares in it, I'm there! The other thing that makes this out of the ordinary is the amount of shimmer in - hopefully you can just about see it in some of the photos. 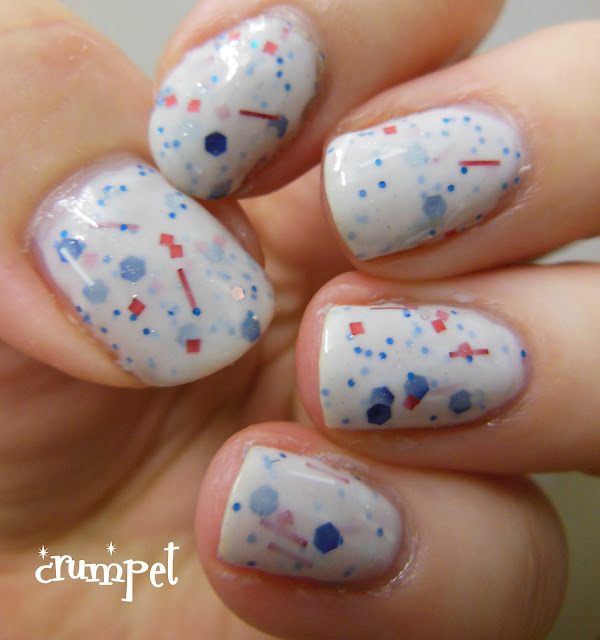 Next was Clown Toots - this is from Jen's new range. This is quite deceptive. 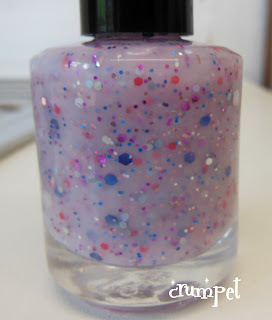 From the bottle shot, it looks like a very milky lilac soup - actually, the polish is sheer. 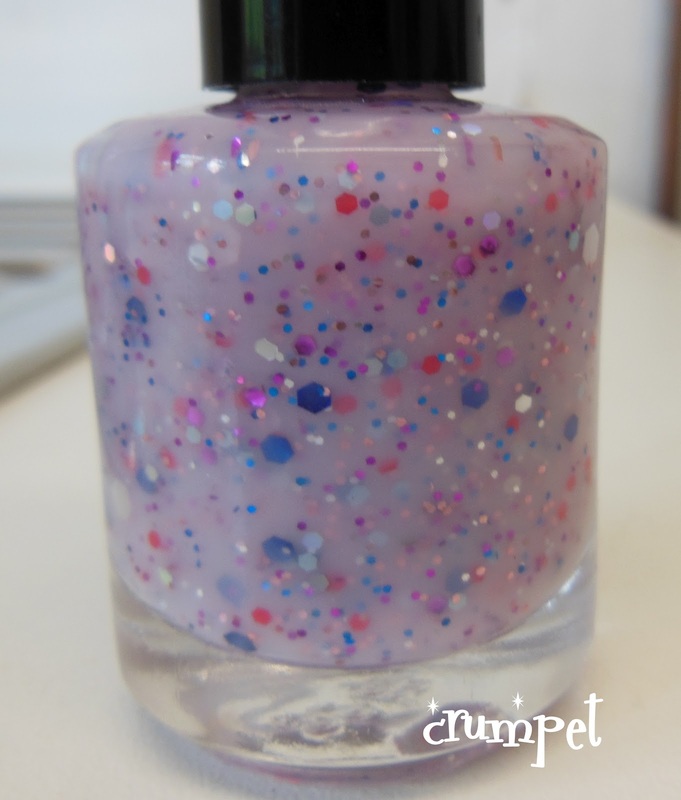 This is not a polish that you can make opaque, so despite how it looks from the outside, this is a glitter topper. 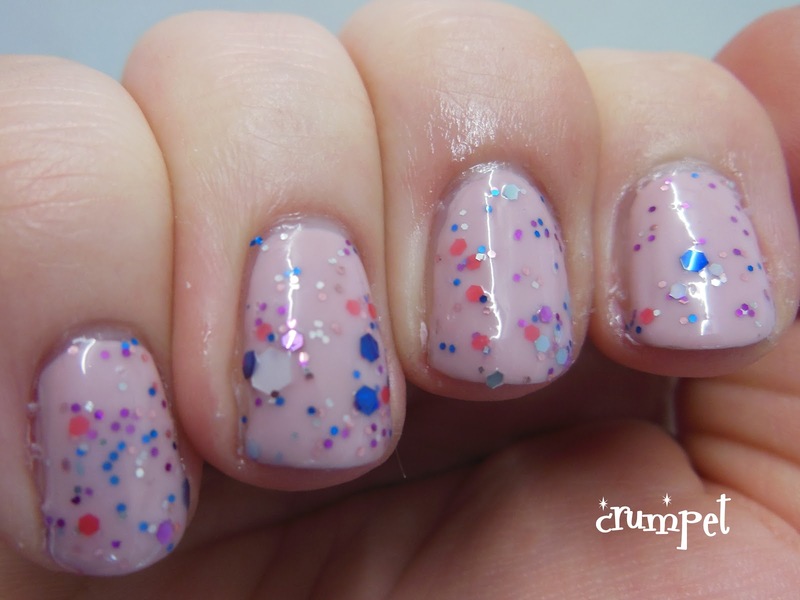 To be fair, it's a very delicate glitter topper, sprinkled with red, white, blue, pink and silver glitter in varying sizes. 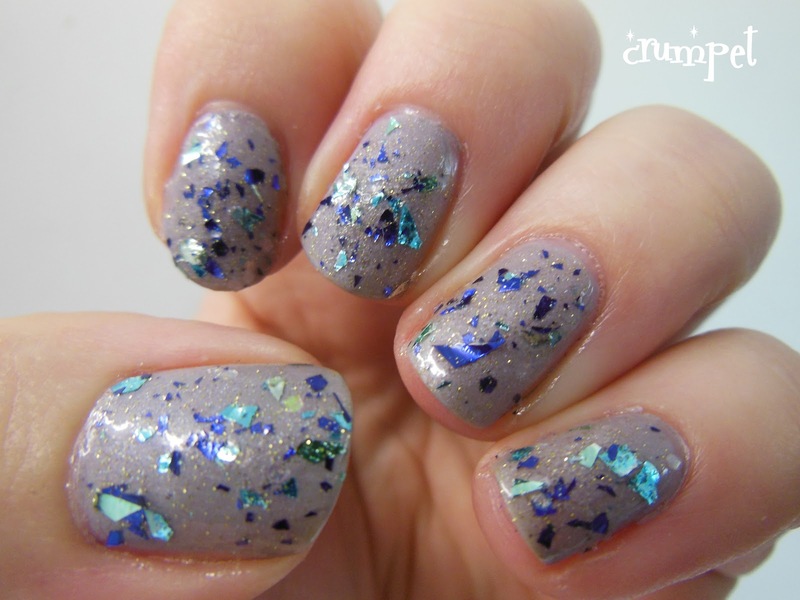 It has a very delicate fairy look at one coat, so if you're looking for a subtle work glitter, this is a definite possibility. 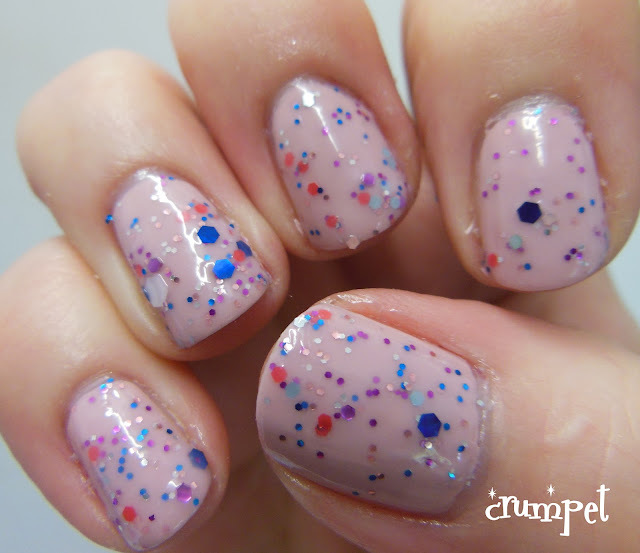 I've got this layered over OPI My Very First Knockwurst and you have to admit they make a very lovely couple. 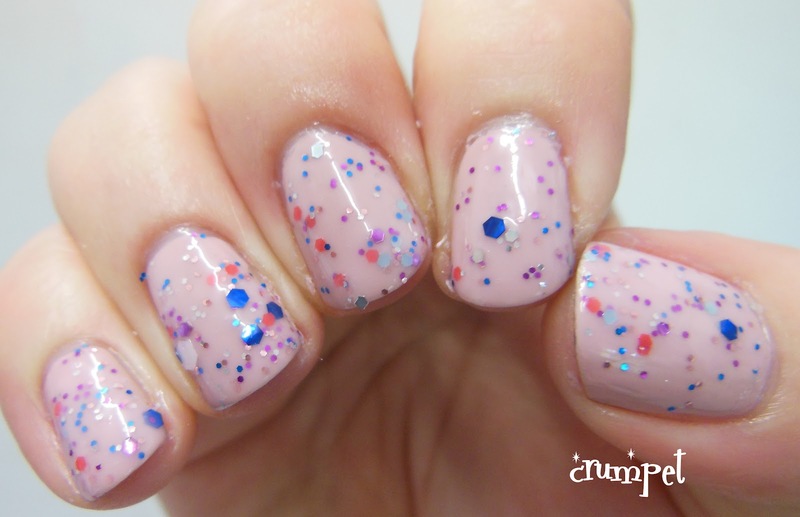 The creamy goodness of the OPI perfectly compliments the sugary sweetness of the glitter mix. One final word on Clown Toots. It's scented. I know this doesn't make a difference to most of you, but it does to me. I suffer badly with my sinuses, and even some perfumes can make me physically vomit (Tresor, I'm looking at you), so I always avoid scented polishes if I can. That said, this one wasn't too overpowering, so we got on ok, but I'm sure I'd have struggled if I'd taken this one to bed and curled up in a ball. And then .... there was Hippie Fest. 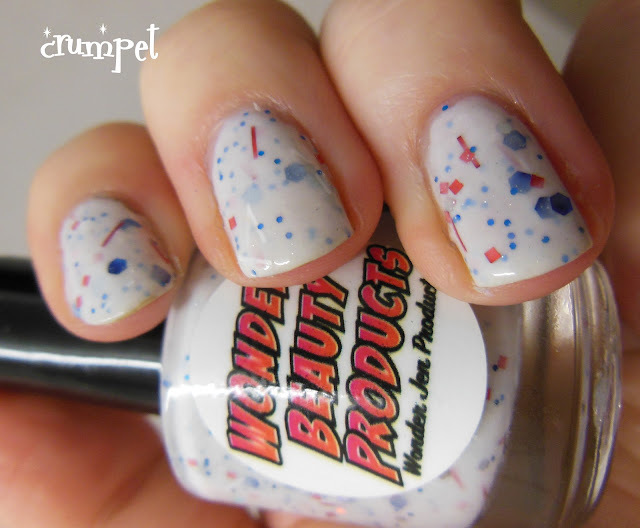 My absolute favourite of the bunch, and the reason I am so grateful polish makers send their polishes out for review. I honestly don't think I would have bought this, yet I love it, and it's almost Crumpety-perfect. In the bottle, this looks like a bizarre inter-galactic grey soup, and I assumed it was opaque. 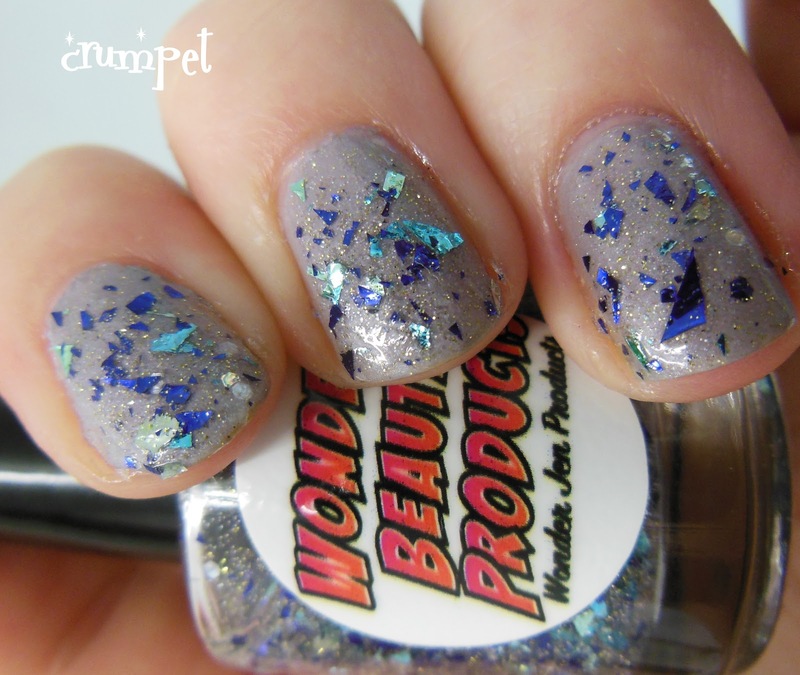 No, it is not - it is a glitter topper. 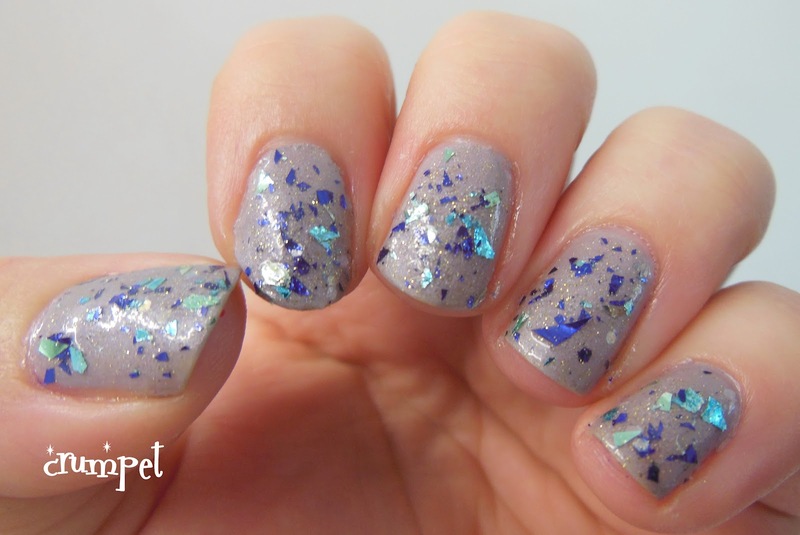 Oh the glitter is shredded glitter, a type of glitter I don't like .... oh, but it's purple ... oooh and teal .... oh that looks good ... oh, there's shimmer .... oh ... WOW. So, basically this is a bottle of everything I would usually avoid and yet it's PERFECT - how funny is that! I love the randomness of the shredded pieces, and the exact tones of the purples, teals and greens compliment each other perfectly. 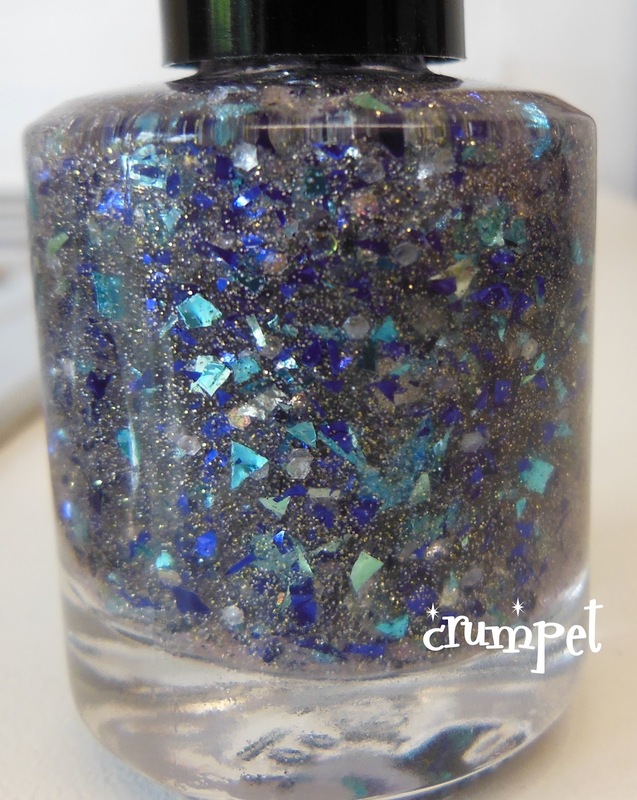 The base of the polish is a total shimmer fest, so you also get the finest dusting of fairy wings all over the nail. 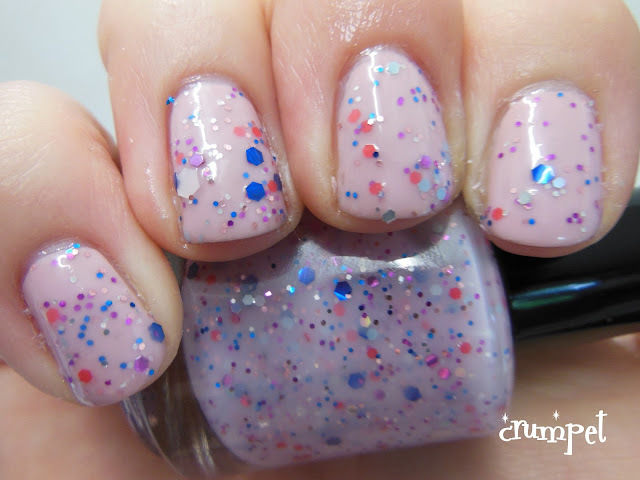 I've got this over OPI Sheer Your Toys, and again, they work so well together. So thank you Jen, I would never have bought this and oh wow I would have been missing out. It's just about perfect for the rainy weather we're about to endure in the UK. Love love love. 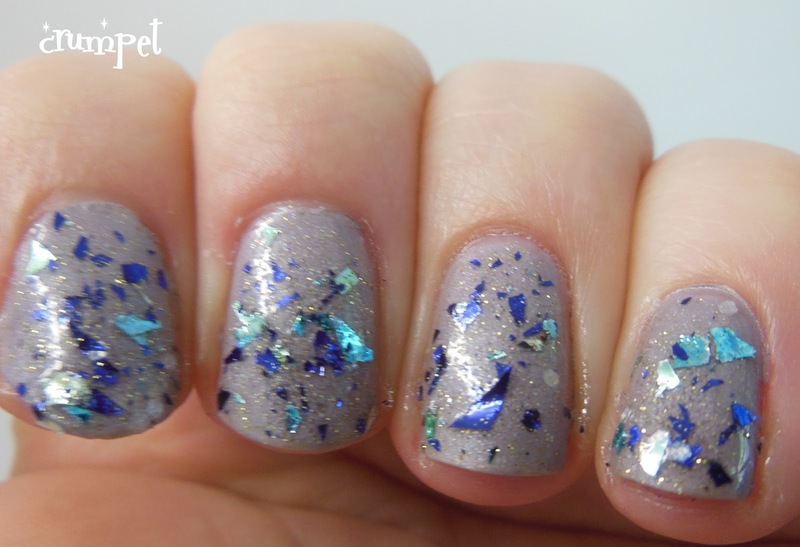 So just when I thought I owned ALL the glitters, I now have to go and find ALL the shard glitters - holy piece of pie I am loving them. 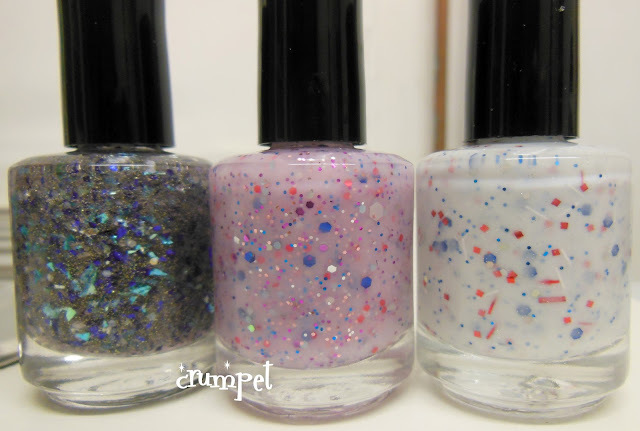 These polishes were all sent to me for an honest review, and you can check Jen's Etsy store out HERE.